California, Oregon, Washington, Alaska, British Columbia—a migratory form of the cutthroat trout haunts beaches, points, creeks, and rivers along most of the west coast of North America. Fly-fishers know him as the sea-run cutthroat, a muscular slab of spotted silver that can grow to several pounds. And among cutthroats there may be big Pacific Salmon. Cutthroat trout are born in rivers but migrate out of them into salt water to feed on its abundance. Sea-run cutthroat trout can be caught at certain tides and in specific sorts of structure in salt water, and in particular kinds of holding water when they return to rivers to feed or spawn. In Flies for Sea-Run Cutthroat Trout DVD, fly-fishing celebrity Skip Morris will show you how to tie such proven sea-run cutthroat flies as the Raccoon, Jim Dandy, Spruce Fly, and others—and then show you where and how to fish them. He'll take you from tying the patterns at the vise to walking a beach or wading a river and working them for sea-runs and salmon. the fascinating flies that consistently take them. Why these particular flies for sea-run cutthroat? tying sea-run flies in general. 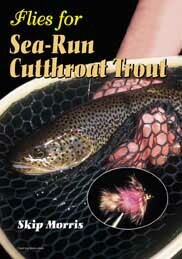 Go to Amazon to check for copies of "Flies for Sea-Run Cutthroat Trout" DVD.